By now, many have attest to the fact that Windows 7 is noticeably faster than its predecessors, but by how much? BetaNews took the liberty of running tests across several browsers, and found that most browsers ran 12-18% faster in Windows 7 than in Vista SP2. Results were taken from tests conducted on fully updated installations of Windows 7 Release Candidate (Build 7100) and Windows Vista SP2. 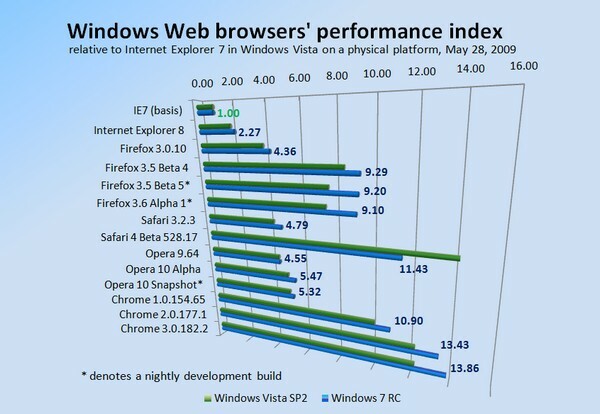 All browsers tested with the exception of Safari 4 Beta 528.17 performed faster in Windows 7. That particular version of Safari runs 22% slower in Windows 7 than in Vista, and is probably due to some sort of bug. From the stable release versions of the browsers, Safari had the highest performance increase percentage at 18%, while Opera had the least with 2%. Moving on to the nightly development builds, generally all browsers had a higher percentage of increase on Windows 7, indicating that developers have been paying attention to Microsoft’s upcoming OS. Of the developer builds, Firefox 3.5b4 was in the lead with a 28% performance increase. Firefox 3.6b1 did even better with 30% faster speeds. Again, Opera had the least percentage of improvement with 8%. See the chart below for full results. IE7 was the base, and each number at the end of the bars indicate how many times faster than IE7 that browser runs, on Windows 7. Keep in mind that most of these browsers were released before Windows 7 Release Candidate, meaning that there is still tons of room for increased performance in future builds. This is the kind of performance increase that really makes Windows 7 shine. There’s a good likelihood that other applications may be experiencing a similar kind of performance increase from Vista as well.